If you know how to paint a fabric camouflage pattern, making custom gear for yourself is simple and fun. 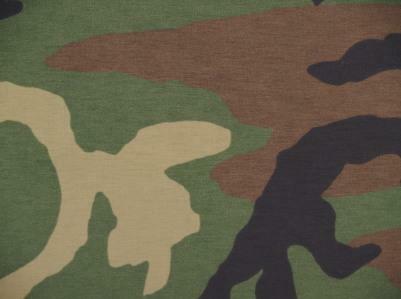 There are fabric spray paints which make painting a camo pattern on fabric easy. Just choose your fabric and follow laundering instructions to make sure that all of the sizing is out of the fiber. Don't use dryer sheets when you dry the garment, because that will cause the fabric to repel the paints. The colors you choose will depend on the type of camouflage that you want. For a desert look, blend yellow, beige, and brown. For a deep woods camouflage, blend green, yellow, and brown. Any combination that appeals to your sense of adventure. Simply Spray has a camouflage kit that has green, tan, and brown fabric spray paints included. Buying a kit is the easiest way to get all the colors at once. Once you have decided which colors to use in your camouflage project, it is time to begin spraying. Fabric spray paints overlap and blend easily so you can get the subtle color changes you are looking for. You will start with the lightest color and spray blotches randomly on your fabric. Now take the next lightest color and do the same thing, allowing areas of the two paint colors to overlap. Leave some areas paint free so that you have a clean place to add the last color. Finally, take the darkest color and paint the rest of the fabric, allowing the spray to overlap the other paint colors so that all three of the paints blend in some areas. This is easier if you have a piece of camouflage fabric or a picture to look at. To paint a pine needle pattern on your fabric, you will need some pine straw. Paint a base coat with the lightest color. Now, lay some of the straw down over your fabric in a random pattern. Make sure that the straw is pressed tightly against the surface and that the fabric shows through. Using your second color spray across the pine straw with a cross hatch motion, as if you were making X's. Add more needles and continue spraying with the next color. You can use as many colors as you like, building up layers of color. Just add a layer of needles each time. This technique takes some practice to get it just right. You may be able to find camouflage fabric paint at your local store. If not, it is readily available at Fabric Spray Paint.com. Wait at least 24 hours before wearing. Wait 72 hours before washing. Wash in cold water, inside out. By using these tips, your custom camouflage item will last a long time.